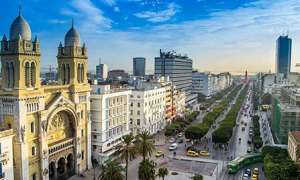 The Tunisian capital – home to one in ten of the population – combines a modern, European-style city of tree-lined avenues with a vibrant, atmospheric medina listed by UNESCO as a World Heritage Site. The main entrance to the medina is through an arched gateway known as the Bab el Bahr (or Porte de France) on Place de la Victoire. The main thoroughfare through the medina, rue Djamaa Ez-Zitouna, is often bustling with tourists but more authentic souks (markets) can be found in the myriad of surrounding alleys. Originally, each souk specialised in a single trade. Among the oldest is the 13th-century Souk el Attarine (the perfume-makers’ market) which still sells scents and essential oils. If you get lost, the major landmark is the Zitouna Mosque (also known as the Great Mosque) – the largest in Tunisia. It is the only mosque in the city which can be visited by non-Muslims and even here, access is restricted to a viewing enclosure overlooking a polished marble courtyard. The Bardo Museum is a major tourist attraction, housing one of the world’s greatest collections of Roman mosaics. 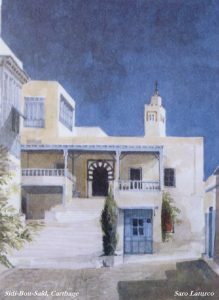 Situated in a former palace belonging to the Husaynid beys who ruled Tunisia in the 18th and 19th centuries, the museum includes archaeological treasures from the Carthaginian, Roman, early Christian and Islamic eras. The Roman section is the undoubted highlight with mosaics covering entire floors and walls, many of them almost completely intact. Common themes include hunting and farming scenes, Greek and Roman gods, sea battles and family life. Another popular museum – the National Museum of Carthage –is located on the outskirts of the city near the airport. It is best visited immediately prior to exploring the ruins of Carthage itself (see Historic Sites). EXCURSIONS: Close to Carthage, Sidi Bou Said is often described as Tunisia’s prettiest village. 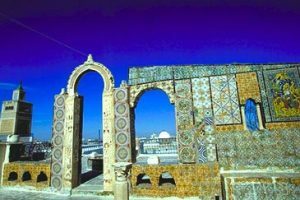 Its cobbled streets and whitewashed houses with light blue window grilles and studded doors has made it a popular stop on any excursion to the Tunis area. Despite its popularity, it has managed to retain its charm. The Café Sidi Chabanne is one of the best places in Tunisia to sample the national drink, mint tea, which is served piping hot and topped with pine nuts. Other suburbs of Tunis include Gammarth which has fast become a fully-fledged resort of luxury hotels, including the 5-star La Residence, often described as the best hotel in Tunisia. La Marsa is another upmarket beachfront suburb with a palm tree-lined corniche and long sandy beach. La Goulette is noted for its excellent fish restaurants which attract crowds from Tunis especially on warm summer evenings. Once a pirates’ stronghold, the town is at the mouth (‘the gullet’) of the Tunis canal and remains a busy cargo and ferry port. It is linked to Tunis by a suburban rail service, the TGM. Travel time to the centre of Tunis is less than 30 minutes.